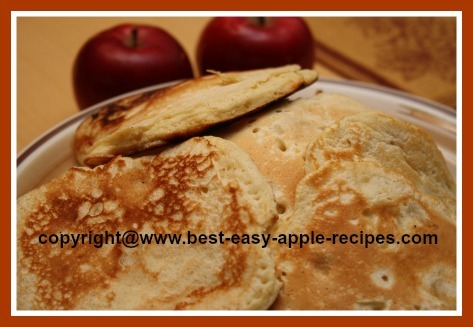 I just made this Recipe for Pancakes with Apples and optional Homemade Apple Cinnamon Sauce, and they taste sooo good! 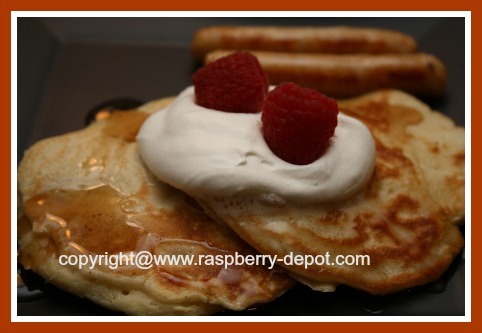 Whether it's Pancake Day, or you just feel like making deliciously delicious pancakes, these are a great choice! Add sausage as a side, and make it a meal! Our family loves pancakes for breakfast, brunch, lunch or for dinner...anytime is Pancake Time! Top these scrumptious pancakes with the homemade sauce recipe, maple syrup, or any fruit syrup. I like to a add a dollop of whipping cream and fresh fruit that I have on hand. Be creative! This recipe makes about 18 medium-large pancakes. If you want to make less (or more), simply adjust the ingredient measurements accordingly. Left-over pancakes will keep in the refrigerator for up to a few days. Re-heat the left-overs in the microwave, and enjoy them on another day! In a small bowl, whisk together the flour, salt, baking powder and ground cinnamon. 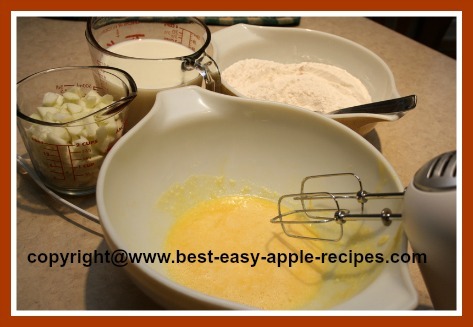 In a large bowl, using an electric hand mixer, beat the eggs, and then beat in the milk and the melted butter. Gradually mix in the dry ingredients, mixing just until ingredients are well combined. Fold in the chopped apple pieces. Using a ladle, spoon the pancake batter onto a hot, lightly greased griddle. 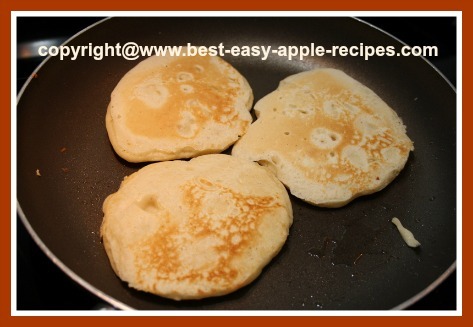 Cook until bubbles begin to appear on the surface of the pancakes, then turn/flip the pancakes over, and brown on the opposite side. Keep the pancakes warm on a plate in the oven, until all the pancakes are cooked. Serve warm with the Apple Cinnamon sauce, or your choice of maple syrup and whipped cream and fresh fruit. Makes about 18 medium-large apple pancakes. In a small saucepan, Combine the brown sugar, apple juice and cinnamon and bring mixture to a boil, stirring almost constantly to avoid sticking and burning. Stir until mixture thickens to a heavy syrup (about 5 minutes).